The camp weekend will be at Eagle Bay, a few hours south of Perth, with special activities hosted at the nearby Forest Adventures park. 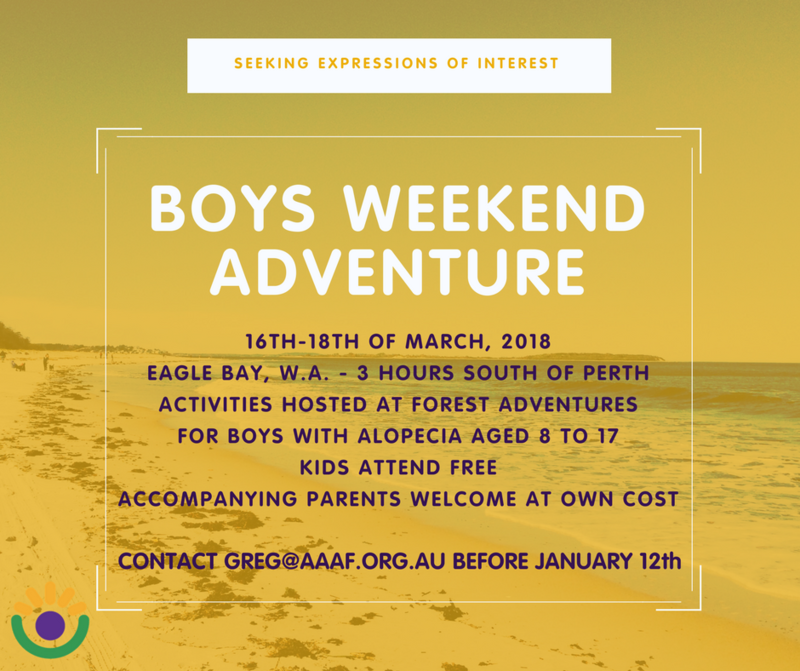 This camp will be open to boys with any form of Alopecia Areata aged 8-17 at no cost, inclusive of food, accommodation and activities during the weekend. All costs are covered for the boys, excepting transport to and from Eagle Bay or food on Friday night. Deposits of $50 will be required to secure a place at the camp, and returned after the camp. Late withdrawals from the camp will cause deposits to be forfeit. Boys are welcome to be accompanied by one parent or guardian, though they are asked to pay their own costs of $100. This will be a super fun weekend camp for boys with Alopecia to meet others living with the condition and enjoy beach activities, pizza making and the exciting challenges at Forest Adventures. If this sounds like something you or your family member would be interested in attending, contact greg@aaaf.org.au for further information. Please remember to provide the camp attendees full name, a contact phone and email, general information about where you will be travelling from and, if applicable, whether you would like to accompany as a parent or guardian.